Killer7 is an action-adventure game developed by Grasshopper Manufacture and published by Capcom. Released in 2005 the game is part of the Capcom Five series. 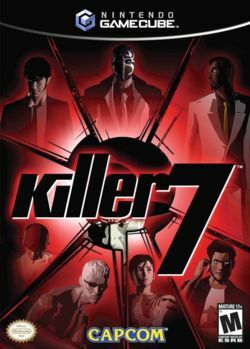 Killer7 features unique cel-shaded graphics and takes place on-rails, there are also a large number of puzzles which add an extra element to the game. Despite being written by Suda51 and being produced by Shinji Mikami the game has received average reviews. But the GameCube version in particular has since overcome those early average responses and it is now well respected and often cited as an essential to any Cube owners collection. The character design in particular has been praised by many. This page was last edited on 13 August 2011, at 08:17.